through a serious stage of depression during their lifetime. 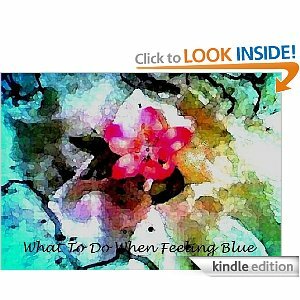 So, what can you do when feeling blue? open to possibility and alive with love for the world. stretching, walking, riding my bike. decisions, I'm happier and I have less to be depressed about. happy for some reason. I think it is the essential oils. 5. Listening to new music and watching nature DVDs. Olive oil moisturizes while grapefruit, lemon oil and mandarin orange oil refresh. 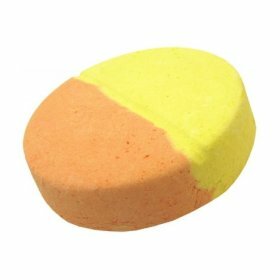 This is a large foaming bath treat that looks like a big fizzy orange vitamin pill that you put in water. It seems to foam slowly and eventually I broke it into pieces to help the process along. It kept fizzing and foaming creating tiny orange and yellow islands within the bubbles (I added some bubble bath first - you might want to try some Happy Hippy shower gel). Eventually the water turned creamy (olive oil and hemp oil) and this bath reminded me of a creamsicle. Bergamot, orange flower and gardenia also make this a beautiful calming bath that leaves you in a good mood. This bath is fun with the Lemslip Buttercream. I keep applying some "Whoosh" temple balm to my wrists and happily inhaling deeply. This bath made me feel warm and snuggly and in the mood for lemon meringue pie or lemon sugar cookies or lemon tea. This is a good bath for the morning or evening, depending on your mood. I was drinking Celestial Seasonings Tension Tamer Extra with this LUSH experience. If you love "Happy Hippy" shower gel, this fun bath product will impress you. changes, decreased energy, oversleeping and thoughts of suicide. to sleep, irritability, increased desire for isolation. 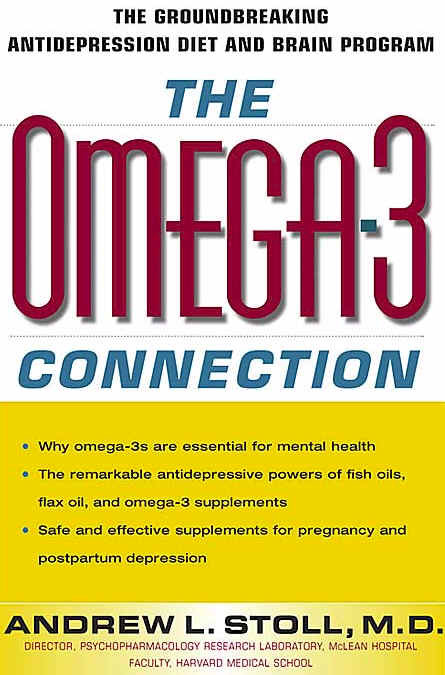 Omega-3 could change your life for the better! information that could change your life. with family and friends. Buy a bunch of fragrant flowers for yourself or for a friend. Both will make you feel good. Infuse your space with scents like jasmine and sandalwood. snow-shoeing, etc. When light enters your eyes, it stimulates the brain to produce serotonin. This triggers a cascade of chemical changes in the brain that significantly improves your mood. They say that getting sunlight can make you more happy than vigorous exercise. So, exercise in the sun to brighten your mood. Laughing also helps, walk with a friend. 5. Go to an indoor garden or arboretum. 6. Go ice skating or rollerblading. 7. Have a day out shopping. 8. Spend the afternoon or evening reading a book that will make you laugh. A big part of staying healthy is having goals, things to look forward to. I'm doing the work I was put on this earth to do. I live in a place where I like to be. We have the ability to influence our own lives more than we know. 10. Visit a beautiful church or go to a show, play or concert. Tune into a different radio station. is good medicine for your mind. This is called taking care of your "inner balance." 12. Take a short nap in the middle of the day so you are not so worn out! Maybe on a Sunday or Saturday. 13. Move a chair close to the window where the sun comes in and read a book indoors in the sun. Organizing things and keeping things orderly is good for peace of mind. I think it helps if you are listening to good music, then maybe you won't be as depressed. online or watch movies that deal with real-life issues. 15. Say "yes" to your priorities. Fight the "superwoman" syndrome. Scale down your expectations. Write down attainable goals. 16. Light Candles: Take a nice hot bath with a few drops of your favorite essential oils. Buy a new perfume or soaps with a floral or exotic scent. While in the tub, condition your hair with a aromatic hair mask. Spoil yourself. 17. Breathe Deeply - If your blood contains too much carbon dioxide, it can make you feel tired. 19. Go to the library and look in the humor section for some great books. 20. Take a break from radio and TV news for a few days, that is sure to depress anyone! Play some favorite music. Negative thinking is one of the most destructive forces in our lives. Those voices in our heads can have a profound effect on how we see the world. negative messages with positive messages. 21. Dine by candlelight. Light 20 candles all in one room. Nurture Romance and beauty in your life. 22. Befriend positive people. Cultivate those friends in your garden who uplift and inspire. Join a forum where people are positive and friendly. Patricia Alexander and Michael Burgos have created a beautifully designed book with artwork by Dean Andrews. The backgrounds on each page seem to embrace the quotes, wisdom and personal experiences of the authors. "The siren's call to `toxic' short-lived comfort is loud and alluring and can draw out our own good instincts for comfort that is real and meaningful." The Book of Comforts explores: comfort vs. indulgence, obsession vs. hobby and toxic vs. healing. How do you comfort yourself and not feel guilty about spending time on yourself? How can you validate yourself and validate others? By looking at stressful issues with a renewed sense of vision this book teaches you to expand your interests or even to reconsider the miracle of sleep. The authors have survived numerous life challenges and have come face to face with their own needs for creative comfort. This universal need to soothe the soul is expressed beautifully in quotes, tips, anecdotes and even a cute observation from Ender the Cat. 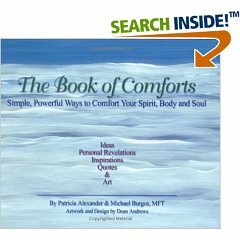 This book would be perfect for doctor's offices, massage therapy waiting rooms, gifts and as an introduction to the healing benefits of healthy comfort. The ribbon to keep your place is a thoughtful addition and the padded book cover makes this a comfy read. I liked the advice like: "Get thee to a Jacuzzi" or "Take Yourself to the movies." While this book may inspire you to add more comfort to your own life, I found that this book could also be helpful in giving you ideas for how to provide comfort to friends and family. The section on massage may inspire you to buy someone a gift certificate for massage or you may find yourself creating CDs of soothing music or inviting a friend to go for a walk out in nature. Patricia Alexander and Michael Burgos have written a book with ideas you can incorporate into your daily routines. Soon, you will find you are happier, more satisfied with life and enjoying each moment with a higher level of contentment. 23. Start a book club or join in on a discussion board about life and books. 24. Drink a cup of peppermint tea while researching better eating habits. Food is the ultimate energy source. 25. Bake something wonderful in the winter, like cinnamon rolls or bread. oatmeal cookies or a loaf of garlic bread. Rejecting the Positive - This is when you can't accept something good happening to you. Victimization - Thinking every setback makes you a failure. Name-calling - abusing yourself with negative thoughts. 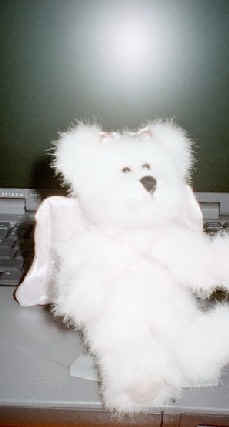 Being Clairvoyant - Thinking all the outcomes of your life will be negative, so why even try? I will learn to say no more often to make time for me. I will continue to improve my situation. move forward with renewed purpose. I will consider the possibilities and reach for the stars. I deserve compassion and care. Today I will find a way to rest, relax and have a moment of recreation. I will learn to accept change and choose to change for the better. 26. Buy some aromatherapy bath products for the shower. Look for uplifting scents. polyunsaturated fatty acids necessary for optimal brain function and feelings of well-being. will be saving a life. that brings you happiness each morning when you awake. funny cards. Even more fun...take a friend with you and you can share the laughs. enjoy the good and the bad. That is what makes life interesting! Be a survivor. 33. Nibble on a piece of chocolate. It contains phenylethylamine and theobromine. 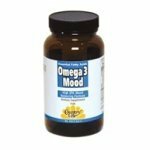 This boosts your own mood-elevating chemicals, serotonin and dopamine. less than we do. Think of the simple things like how warm the sun feels on your skin. Be an Angel to Someone! of "giving of yourself" will actually increase your happiness. Read about my experience with World Vision. to talk to who might enjoy hearing about a solution you discovered. 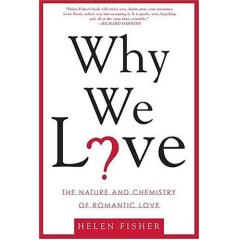 us more than we can ever learn on a happy day. 38. Find a way today to make someone else happy! It is the key to your own happiness. 41. Get outside your home at least once a day. Find happiness in nature. Explore your world. Take a week and go to a sunny spa ...say in Arizona. Humor, Reliability, Compassion, Resilience, Flexibility and Empathy. time when you are developing as a soul, in the journey called life. 44. Make a list of everything you want to do in life...the really important things. "Yes, You Can!" by Sam Deep. To find the reviews...link through the review page. greatest loss in life. The greatest loss is what dies within us while we live." -Norman Cousins. and now I feel that she is looking after me and cooks with me in spirit. Instead of being angry that she is gone, I look forward to seeing her again one day in heaven. in the next life with God. 47. Resolve bitterness. Forgive anyone for everything they have ever done to hurt you. Swallowing your pride allows you to free your soul and be who you were meant to be. so many interests buried inside of you just waiting to jump out and surprise you. 49. Simplify Your Life. Cut back on the complexities of your everyday existence. The happiest people find their purpose in life and follow their bliss every day. 51. Increase the Self-Esteem of others. help people see the beauty in themselves. 52. Accept Change. This too will soon pass! only He can give you. 54. Try acupuncture or massage. Go for a manicure and pedicure. dinner. Spoil yourself or ask for gift certificates for gifts. 55. Take a child to the zoo or learn calligraphy. 56. Turn off the news and listen to relaxing music. www.Rhapsody.com is amazing! I look up music and you can listen to entire albums and keep a list of your favorite music. the dark; once exposed, they begin to wilt." 58. Watch a favorite movie. 59. Talk to a friend who understands you as a soul. 62. Buy a pet - a cat or a dog can add so much happiness to your life. 63. Fall in love with life itself. People are interesting because of their interests. 64. Pray and ask your friends to pray for you. go from your soul to your computer and then out into the world. reward yourself for dealing with life's little annoyances. 67. 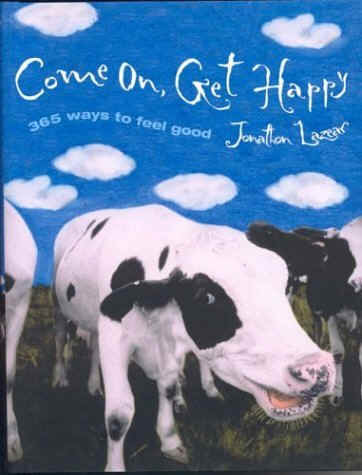 Read tons of great self-help books and listen to healing music. 68. Read poetry. Recently I read Perfectly Said and Jewel's poetry book: a night without armor. 69. Build a Website - This keeps me busy and I always have enjoyable. 70. Send me a book and see a review appear like magic in a few months. review as fast as humanly possible. for its sedating effect and can help to relax muscles. Establish bed-time rituals like reading a book of poetry or a few chapters of a novel. Watch a calming, relaxing or romantic movie. Do a yoga DVD - some knock me out completely because I get so relaxed. Kundalini yoga is recommended because it focuses on meditation and relaxation. Limit caffeine to two eight-ounce cups a day or drink green tea and Rooibos tea. Keep paper and a pen or a notebook/journal by the bed to jot down thoughts before bed. This saves you staying up thinking about all the things you have to get done. can help you get them out of your head. Reset your body clock by going for a early morning walk. Buy blackout shades or a sleep mask. and then start to make it come true. that a heart is imprisoned not by being broken but by being silenced." 73. Go for a massage or order a massage DVD and learn with someone you love. 74. 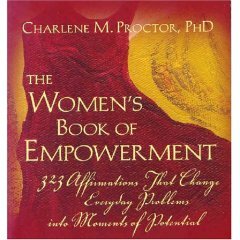 Healing Page - Enhance your self-esteem and find healing Books and CDs. 75. Read Inspiring Quotes - Find a few quotes and put them somewhere you can read them daily. 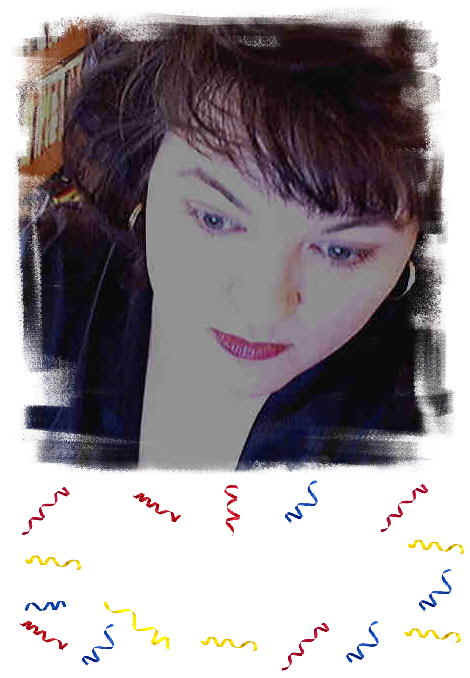 Cooking, Creative Projects, Photography, Publishing, Barbecue. take a blanket and romantic novel to read outside. 80. Go Stargazing on a clear night. 81. Visit a Botanical Garden in your local area. 82. Take a long drive out in nature. 83. Visit a local Farmers market. 84. Bike on a favorite trail. 85. Go to a Zoo or Aquarium. 86. Join a walking club or outdoor club. 87. Take a tour in your local area. 88. Paint and redecorate a room in your house. 89. Design your own stationary. 90. Create a big collage with positive ideas and quotes. 91. Make a sandcastle at a beach, good reason to take a vacation. 92. Learn a new craft, like beadmaking. Visit a local craft store for inspiration. 95. Buy a cookbook and try at least three recipes. 96. Take a class in one of your main interests, writing, cooking, art, etc. 97. Check the newspaper for local events and attend something new. 98. Visit your local library and if they have a used book store, buy something fun to review. 100. Buy a small bag like an Asian tote bag, a journal and a beautiful pen. Copy your favorite quotes or poetry into the journal. If you can find a beautiful print of art you enjoy, paste it on the journal and brush "Mod Podge" over the picture so you can create a custom journal. You can copy photographs too and make beautiful customized journals for friends and relatives. 101. Find something in your house you are not using and donate it to charity. I can usually find a small bag of items I'm no longer using and someone else might benefit from the items. 102. Join www.bookcrossing.com - A fun way to send books out into the world. 103. 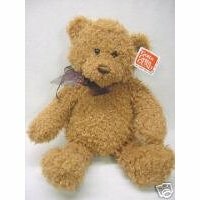 Give someone in another country a gift they will love: www.worldvisiongifts.org. This is sure to make you happy because giving is one of the ways you can experience more joy in your life. The gifts are really fun, like you can give a family a camel or sheep so a family can have wool and wholesome milk. There are fruit trees, gardening supplies and building supplies for a school. You could donate money for an entire school and you get progress reports. You can also give items to kids in America, like basic necessities, blankets and toys. One of my favorite items is the Mongolian Ger - a Yurt house you can give to a family to keep them safe from the elements. more because you are alive. Now that is a reason to live! 104. Beat daily stress by getting ready for your day the day before. 107. Go get a massage and a facial. 108. Write down more of your thoughts to clear out your mind. 109. Remember the things that you love about life. 110. Be your true authentic self who is satisfied, happy and wants to be alive.